I thought I’d finished the six post series on games that influenced Athenge, but I soon saw a game that changed my plans. This post is about how I analyze games by verbs, decision timing, and business concerns. Over the weekend Snarky dropped by for some ribs and playtesting. I think of early playtesting as scientific experimentation and had a specific question I wanted the session to answer: is the design of the core gameplay, op combat, any fun? I mentioned I have a rant about how I think of most browser-based games as belonging to genre called “farming games”. The defining characteristic is that they are about farming other players or being farmed until you quit in disgust. You build a city or an empire and you usually can do exactly two things with other players: trade resources or fight. To fight you build some military units and point them to sack some other player. A few hours later, if they overcome the defenses, they cart back some loot for you. The game’s leaderboard ranks by how many resources you’ve gathered (or some derivative like number of upgrades purchased), so the more loot you haul in the better. When you’re collecting resources and upgrading your cities there’s a positive feedback loop at work: you can build a bigger sawmill, hire more children to mine, reach a faster warp factor on your starships, all so you can bring in more resources. Games often address this by making upgrade costs grow multiplicatively or exponentially while the returns increase linearly, but usually the rate of return grows faster than the rate costs increase. If that last sentence made your eyes glaze over, think of compound interest: the more you have, the faster you earn more. The rich get richer. So every additional resource helps, especially early on. Players have a strong incentive to attack each other for a bit of loot. Well, not each other — you might lose the resources you invested in your army. Players have a strong incentive to farm the weakest available players, which is roughly synonymous with the newest players. Farming is the act of treating another player as a resource farm. By sending wave after wave, the attacker guarantees the defender won’t have the resources to build defenses and, if they try, will only be able to finish a small percentage that will be snuffed out before it grows to effectiveness. The defender will never get out from under an attacker’s thumb, they’re reduced to passively generating extra resources the attacker uses to grow even faster. The word farm is not hyperbole. Players grow in power over time, there’s little skill involved. Players have to schedule their upgrades well (eg. make sure to harvest crops before building a refinery that would employ new workers who would otherwise starve), but the dominant factor is exponential growth over time (applying this situation to capitalist economies is left as an exercise for the reader and college freshmen who have just read Marx for the first time). The best players to attack are new players, they can’t and often don’t know how to defend themselves. If you want a picture of the future, imagine a boot stamping on a newbie face — forever. If you think I’m belaboring a really obvious point, congratulations, you understand game design better than the creators of farming games. Some designers realize that it’s a problem and have worked to mitigate it. New players receive automatic protection for their first week of play and can’t be the target of any attacks. This just pushes it back, of course, making the most fallow farms players who are seven days and one minute old (and this is usually when the first attack arrives). Some games restrict players from attacking anyone more than a few rankings above or below them, but that just means players shift to farm whichever player is at the very bottom of their allowed range. I’ve seen one game that allows you to hire the Imperial Army to come protect you. For 20% off the top of your resource income they’ll send a detachment of soldiers that can fend off the typical army of any player younger than a month or so. For 40%, you regain your newbie protection and can’t be targeted at all. I’ve seen a few games that will cut out the middleman and and build a mechanic to allow you to directly pay the protection money to your farmer in return for this arrangement being prominently visible to other players, the presumption being that others attackers will stay away rather than risk picking a fight with someone their own size. But these percentages bring up that feedback loop again. If you’re getting farmed or paying protection, you’ve lowered your rate of growth. Your attacker’s stays at 100% or is inflated by the resources they’ve farmed (directly so in the protection racket). The newbie will never be able to challenge established attackers, and players who don’t farm will fall behind and become farms themselves. Players can band together into guilds for mutual defense, but this only serves to shift the problem from individual players to guilds while making life worse for lone players. All of the above still applies. I’m going to skip recounting the less-popular and equally ineffective counters and ask: What’s a newbie to do? Quit, obviously. I can only wish I had metrics for these games (they’re not generally run with the care and attention that lends itself to gathering data for analysis), but the dropout rate is huge. I’d guess most farming games lose at least the bottom 80% of players every month. The players who grit their teeth and hang in there or have the luck of a little quiet to set up their own farms are typically amoral teenage boys. They’re not good customers and they don’t form a healthy community. The prospect of living in a lawless world populated by violent psychopaths with gutter mouths isn’t generally appealing, further thinning the ranks of newbies. I didn’t expect to rant at such length, but this is why I didn’t start building a game of my own ten years ago. I couldn’t see how to fix this problem without giving up on persistence altogether. Playing WeeWar was an inspiration because I realized that browser games don’t have to be slaves to persistence to be fun and I read David Sirlin’s insightful blog posts and book on multiplayer game design that I’ll cover in depth in the last post on game influences. This is part two in a series on games that influenced my design for a web game. WeeWar is a turn-based strategy game for 2-6 players. Starting a game is as simple as choosing a map and recruiting opponents. Each base you control earns you money to spend producing units. You advance across the map and win by smashing enemy units and wresting control of all the bases. The core of combat is fairly rock-paper-scissors: infantry beats tanks, tanks beat vehicles, vehicles beat infantry. You manage your flow of units to the front to bring the right weapons to bear without ceding ground (and, hopefully, fighting on favorable terrain). Artillery units can decimate opposing units but are weak and must keep their distance. Air and sea units add further complexity. WeeWar’s mechanism for taking turns is very nicely done. You and your opponents don’t have to be online at the same time for the length of a full game because you get 24 hours to take each turn. If both you and your opponent are online at the same time and taking turns promptly you can play most maps in under a half-hour. But anytime that your turn comes up you have a full day to make your move, so it can play like correspondence Chess where you and your opponent alternate moves once a day. You could play several games at once and only play when you have fifteen minutes free to take your turns. 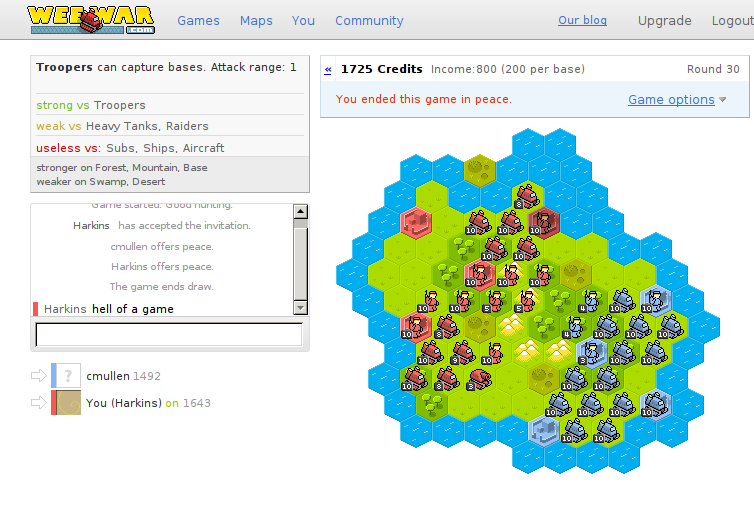 WeeWar is like a perfect translation from board game to the web (though it appears to be based on the Game Boy game Advance Wars). The interface is crisp and responsive, it’s easy to arrange games and chat with your opponents. The web browser just falls away and only the game matters, a sign that knows how to use its medium to its fullest. The genre couldn’t be more different from web games like Ikariam. Instead of building up a long-lasting empire or RPG character, you’re in standalone games that each last a few days, nothing carries between battles. It’s a bit of a downside, too: there are no persistent relationships you can form with other players besides adding them to a friends list to see when they’re online. When you finish a game, there’s no mechanism at work to draw you back to the site to play again. WeeWar (besides being fun to play) inspired me to break from the mold. I hadn’t considered the medium and genre separately, so my designs were all very derivative and uninteresting. I decided to try to find a balance between the long continuity of Ikariam and the short sessions of WeeWar because each is a different kind of fun and a incentive to play. Next, I’ll talk about a role-playing game called Tactics Ogre.